I dropped Stranger Things for a while, so I could binge season 2 of The Magicians when it showed up on Netflix. I hope that gives you some context on how much I like this series. Of course, context is not everything, because I’m not even sure what I like about The Magicians. I probably shouldn’t like it. The Magicians is a series that follows a formula so often it may as well be a cartoon. Issues are solved with magic, and all solving of problems creates a new set of problems. Major injuries and losses can be reversed; not all consequences need to stick. They have some way out, and in, to whatever the plot wants to do. And that’s usually bad writing. Normally, I would lambast a series for doing that. Perhaps I didn’t this time, though, because there is truth to the cyclical situation: solve one problem, take a few lasting bruises, and a new problem arises. That’s true to life. Be able to afford a car, finally, and then you must pay for gas. Or, in their world: lose a hand, grow it back, it tries to kill you, so, lock it down with a binding spell. 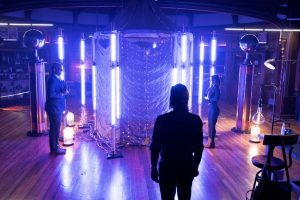 Its flaw is its strength and The Magicians consistently bridges that gap: turn what might be a negative point in other shows into a positive aspect. I mean even the premise follows that rule. The show’s a Harry Potter and Chronicles of Narnia rip-off. Which gives a usual children’s story some serious edge. If you ever wondered what Harry Potter might have been like if the kid gloves came off entirely, here’s your answer. It’s the most realism you’ll get in a show about magic. But it does so without losing its sense of fun. Because it is fun. 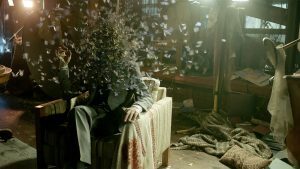 The Magicians is wish fulfillment—like a lot of media—but it’s wish fulfillment without judgment or withholding of darker impulses. It’s escapism to the ultimate level. Escapism from caring about health, morality, or even common ethics. In a word: irresponsibility. Not something to promote, but something adults might crave from time to time. A deep desire for younger years from jaded twenty-year-olds. Even if you never got your owl and were never able to go to Hogwarts; even if you never opened the right wardrobe for Narnia, there are options. With no rabbit hole in sight, there can still be magic, even as an adult. There’s a cost to pay, sure. Very dark costs. But, since it’s just a show: it’s fun to imagine what it might be like to finally get to be a Magician.